Anyone can tell you if a trailer "looks good" or not. But Drew Magary, who spent over a decade working in advertising, is here to tell you whether or not a trailer WORKS. This week's trailer? The second preview for "Mission Impossible: Ghost Protocol." One of the strange things about the "Mission: Impossible" franchise is that we're on the fourth installment of a series that has yet, in my mind, to produce a memorable movie. I mean honestly, apart from Cruise dangling from the wires in the first "Mission: Impossible," do you remember a thing about any of these movies? Do you remember a anything about Ethan Hunt, other than that his hair changes? The Bond series has produced any number of truly great films ("Casino Royale," "Goldfinger," etc. ), but the MI series, despite all the loot it's raked in, is an empty vessel. They don't inspire much in the way of fanboy passion. Go to ComicCon and look around for dudes dressed as Luther Stickell if you don't believe me. However, this new installment was directed by Pixar stud Brad Bird and includes a formidable co-star in Jeremy Renner. Will that be enough to make MI:4 a must-see film in the minds of Americans? Let's watch the trailer and answer a few questions. Does the trailer let us know what the movie's about? Yes. Ethan Hunt walks out of the Kremlin just before it blows up (Stupid Kremlin. WHY WEREN'T YOU BOMB-PROOFED?!). Then everyone is like, "Why did you blow up the Kremlin, bro?" And he's like, "Wha wha wha? I ain't no Kremlin H8R!" And then Hunt is falsely accused and has to go on the run to both clear his name and find the real scumbag behind the mess. And then something called GHOST PROTOCOL is set into motion, which is almost certainly called GHOST PROTOCOL because it sounds way badass. "Ethan! You're in trouble! We'll have to initiate OPERATION BLACK RAZORCLAM." Are there wide shots of various foreign locales? Oh, yes. It's never a spy movie without a bit of conspicuous geography. Are there certain signature MI bits in here? Yes. You have people dangling from wires, the famous MI theme music, and you have Cruise in a CGI disguise, which remains one of the more annoying hallmarks of this series. OMG! THAT JAMAICAN MAN JUST PULLED OFF HIS FACE AND IS ACTUALLY TOM CRUISE! Mistaken identity is an unwelcome sitcom element in any thriller. Is there a pedigreed actor here who says lots of serious things? Yep. That's you, Tom Wilkinson! Do people do patently absurd things, like shooting guns accurately while falling from a rooftop? Of course. Sure, no one could ever hit a fixed target while falling to the ground at 80 mph, but the producers of this film assume you'll just happily accept the wholesale violations of physics. Does the trailer feature Tom Cruise doing XTREEEEM Tom Cruise things? Totally, dude! Look at him run down the side of the Burj Khalifa tower in Dubai! GUITAR SOLO! Did you know Tom Cruise does all his own stunts? Don't worry, because 56 different people who worked on the film will be mandated by PR to let you know that. Most Tom Cruise movies are in fact elaborate infomercials designed to let you know just how kewl and far out Tom Cruise is. He skydives for pleasure, people! How can you drive a car if your windshield has a touchscreen map all over it? No idea. Are there guns? Oh yes. People loading guns. People cocking guns. Cruise and Renner pointing guns at one another. Giant nukes being fired. Lot of gunnage. Plus a fancy car and a really hot spy lady played by Paula Patton. All the empty elements needed are there. 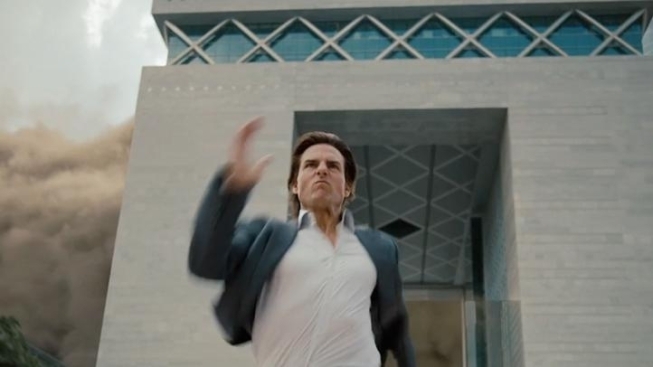 Do we get the signature shot of Tom Cruise running away from an explosion, then being lifted off the ground by that explosion but still surviving his injuries? Yep. He does all his own explosions, you know. Does this trailer work? Not really. There are plenty of thrilling visuals, but you're left feeling like you've seen all this before, with only Renner (whose character was probably summarized by the screenwriter as "wears a nice sweater") and Simon Pegg giving the explosions any real personality. No one cared about Cruise's spy antics in "Knight & Day," and nothing here suggests a new level of character depth or innovative storytelling.